Self-exiled to a new universe, separated from his TARDIS, opposed and manipulated by the Divergence and their agent the Kro’ka, the Doctor has been struggling to work out the nature of the cosmic game in which he’s an unwilling pawn. Now, at last, he has a chance to find the answer – and regain the TARDIS! Threatened and desperate, the Kro’ka abandons his behind-the-scenes machinations to confront the Doctor directly. But will both of them lose their way in the maze of the strange world in which they find themselves? A world in which a clock may have a cuckoo but no hands, a labyrinth imprisoning a paradox, and a Garden of Curiosities reveals something the Doctor has never seen before. 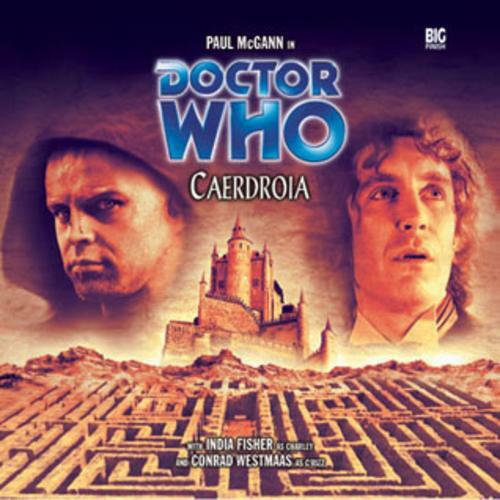 Paul McGann is the Doctor in Caerdroia. In science fiction, there’s always a place for the unknown, the unexplained, and the unusual. The familiar is present only briefly before everything becomes different. Throughout its history, there have been plenty of episodes that have been strange, or unnerving, or a bit creepy. Then, there are those episodes that are just flat out WEIRD. The Fourth Doctor’s mind trip in The Deadly Assassin. The black-and-white gardens from Warrior’s Gate. Tegan losing her mind in Kinda. The entirety of Ghost Light, which was the first Doctor serial I had ever seen and to this day I STILL have no bloody idea what it’s about! Caerdroia is the penultimate episode in the Divergent Universe arc. The Doctor, having figured out the secret of the lack of linear’s time in this reality, confronts the Kro’ka and tricks him into revealing the location of the Divergent’s headquarters. 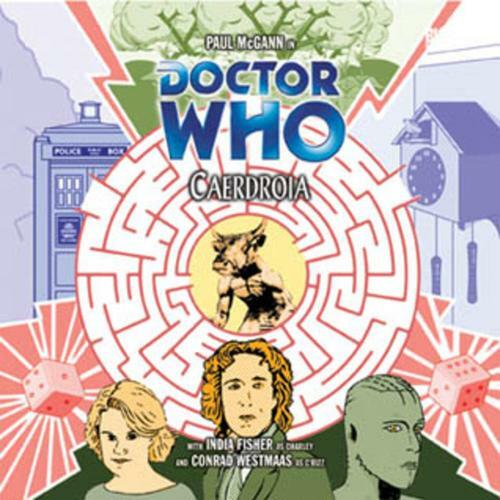 Penned by an author who “gets” the Eighth Doctor better than most, Caerdroia is a series of twists, turns, weird locations, strange settings, and solid acting by its small cast. Sadly, it suffers in the end from a sense of being rushed, as Big Finish attempts to close the book on the Divergent Universe before the beginning of the TV show’s revival. Before (and during) Big Finish’s time with the “classic” license, the Doctor’s adventures were carried on in a series of spin-off books, novels, and short stories. Lloyd Rose is one of the few female writers to have penned a Doctor Who adventure, specifically two very well received novels for the “BBC Eighth Doctor Adventures” line; Camera Obscura and City of the Dead, as well as The Algebra of Ice. Caerdroia continues the sort-of-trend of one-shot authors penning the majority of the Divergent Universe plays. Rose puts together a surreal piece with this audio, full of twists and turns, flipping between farce and tension with ease. Really, including Faith Stealer and The Last, the scripts for this season have been very solid, and it’s a shame they came so late in the Divergence arc. The Doctor’s “showdowns” with the Kro’ka throughout the story are incredibly fulfilling as, after story after story of taunting, the sniveling little git is firmly put into his place by the Doctor time and time again. The moments of levity include C’rizz first encounter with a herd of cows who show keen interest in him and follow him and the Doctor trying to locate the Rhetorical or Genuine Questions Office. But there are moments of tension as well, such as Charley and the Doctor falling through the gears of a gigantic cuckoo clock, trying to save the other in the process. Perhaps the most interesting aspect of Rose’s script is the splitting of the Doctor into three physical copies; one ill-tempered and insensitive, one excitable and ADD-addled, and one calm and rational. As a plot point, it allows for C’rizz and Charley to have their own “Doctors” with them as they explore Caerdroia and lets the scenes develop in a bit of a “two-hander” sort of way. But it also lets Paul McGann off the proverbial leash. Gone is the boredom and lackluster performance from The Last. 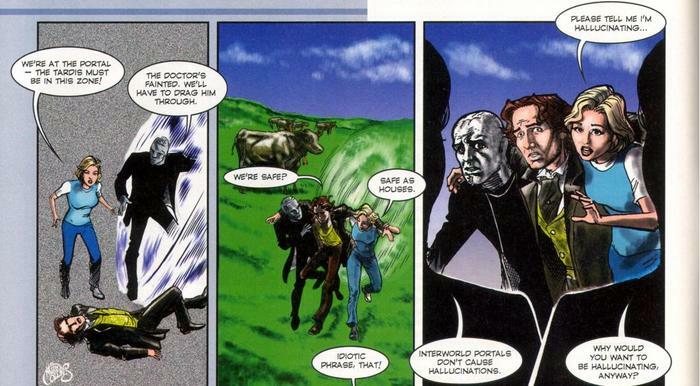 McGann takes the “split personality” concept that Rose hands him and runs with it. It’s a great break from the amnesia from Minuet in Hell and the possession in Zagreus, where McGann was saddled with the “changed personality” gimmick. Instead, he gets a chance to embrace it here. We get a Doctor that is prickly, brave, inquisitive…and since they’re broken up into three distinct parts, the listener gets to see how they ALL make up the Doctor. Sometimes, the Doctor is mean and a jerk, bordering on vindictive. Sometimes, the Doctor is wide-eyed and distracted by anything. Sometimes, the Doctor is rational and compassionate. McGann plays up all of those aspects when he’s in three pieces, but more importantly, he plays them when he’s once again altogether the Doctor. In a lot of ways, Caerdoria is among the best performances of McGann’s time with Big Finish, both when he’s in three pieces and when he’s the Doctor. It’s the kind of performance one wishes McGann could have been allowed to pull of way back in Zagreus. As well, gone is the peppy, death-wish having Charley from The Last. She panics when she’s in danger of being crushed by moving gears, screaming in such a way that the listener finds themselves sliding to the edge of their seat during the cliffhanger. Also back is the smiling, needling, almost-proud-of-the-Doctor mannerisms as she explains to C’rizz what he’s seeing as three Doctors run around trying to make sense of things. A nice touch is her frustration and exasperation at being with the “prickly” Doctor giving way to a realization that even boiled down to his less-than-savory parts, the Doctor is still the Doctor. I’m ready for the Divergent Universe arc to come to a conclusion, so it’s nice to see Charley act the way she did way back when in Seasons of Fear and Neverland. Caerdroia was the first story where I didn’t think to myself “why the heck is C’rizz here again?” He made a mark in Faith Stealer and finally stood on his own in The Last. A good bit of that has been the scripts, and thanks to them Conrad Westmaas has finally gotten a hold on C’rizz. He has no idea why the Doctor is so happy to finally be back inside the TARDIS, freaks out at the fact that the cows are incredibly interested in him, and gives as good as he gets to Charley’s needling of him. Here, there’s no pressure on Cr;izz and as a result, the alien is actually enjoyable and entertaining! Again, ready to go back to the normal universe, but the writers have finally made C’rizz someone worth paying attention to, and both they and Westmaas deserve kudos for turning things around in this second season. Finally put center stage as the antagonist, Stephen Perring gives a great performance…but one that comes off at out of place. The Kro’ka has been taunting the Doctor and his companions during their time in the Interzone, dropping hints, being coy, and mentally screwing around with them. When the Doctor finally tricks the Kro’ka and gets his hands on him, the Kro’ka turns out to be nothing more than a creature who’s in over his head, unable to match wits with the Doctor. His cocky menace goes to sheer desperation over the course of Caerdroia, and Perring sells it. Everything he tries, the Doctor has a counter for. On one hand, it’s a great performance. On the other hand, it absolutely BURIES the Kro’ka as any sort of threat. All the taunting and teasing leading up to this serial is wiped away, made meaningless. The Kro’ka isn’t a threat. The Kro’ka is a joke. It’s a little frustrating because we’ve been led to believe that the Kro’ka was the Divergents’ mouthpiece, and now we’re led to believe he wants to work against them…it happens so fast, it’s a case of mood whiplash. That is the biggest problem with Caerdroia. The serial suffers from a case of being rushed in an effort to wrap up the Divergent Universe arc. By itself, with the different concepts introduced and the explanation of the Kro’ka’s actions, this could have been a solid episode within the larger Divergent Universe metaplot, laying out the truth behind the Kro’ka and setting everything up for the eventual endgame. But everything happens so fast, and so quickly, and with a minimum of set-up or development on the part of the Kro’ka. While the verbal sparring between McGann and Perring is incredibly entertaining, it becomes a case of “tell don’t show.” The Divergents, the Kro’ka’s masters, are spoken about, but never shown. The methods that the Kro’ka’s uses to try to break the Doctor are used, but introduced and quickly forgotten about. Even the big reveal, the Doctor finally reclaiming the TARDIS after seven episodes of searching, doesn’t come off as a big triumphant moment. It’s more like a box on a checklist, one more tick until the Doctor comes home and everything returns to normal. It’s a bummer, because everything surrounding this serial indicates that it should be one of the Big Finish classics. Good script, great performances, and some very nice sound work – you’ll never listen to mooing cows or the grinding gears of a cuckoo clock as well as you would after this story, and how they all tie together is a feather in the hat of Rose – it should all have clicked. I understand Big Finish’s need to finish up this story before the premiere of Rose in 2005, but throwing everything including the kitchen sink into just one story and the frantic way that the vital metaplot points are revealed, explained, and moved on from just make Caerdroia feel like a missed opportunity. Next up – Her name’s Perfection. He’s the Doctor. Together, they face a journey into the dark heart of this mysterious island, to discover the deepest secrets of this timeless cosmos. That’s if the giant crabs, killercrocodiles and murderous natives don’t get them first. Paul McGann is the Doctor in…The Next Life. This entry was posted in Big Finish Review and tagged 3/5, Big Finish, Big Finish Review, C'rizz, Charley Pollard, Conrad Westmaas, Divergent Universe, Doctor Who, Doctor Who Audio, Doctor Who Review, Eighth Doctor, India Fisher, paul mcgann. Bookmark the permalink.